A collection of 30 small batch preserving recipes and 90 recipes in which to use the preserved goods for anyone who's ever headed to their local farmers' market reciting the mantra "I will not overbuy" but has lumbered home with bags overflowing with delicious summer strawberries, zucchini blossoms, and tomatoes, or autumn apples, pears, and cauliflower. Preserving recipes like Marinated Baby Artichokes are followed by recipes for dishes like Marinated Artichoke and Ricotta Pie and Sausages with Marinated Baby Artichokes; a Three-Citrus Marmelade recipe is followed by recipes for Chicken Wings Baked with Three-Citrus Marmelade, Shrmp with Three-Citrus Marmelade and Lime, and Crepes with Three-Citrus Marmelade, and so on. In this book, Eugenia Bone, a New Yorker whose Italian father was forever canning everything from olives to tuna, describes the art of preserving in an accessible way. Though she covers traditional water bath and pressure canning in detail, she also shares simpler methods that allow you to preserve foods using low-tech options like oil-preserving, curing, and freezing. Bone clearly explains each technique so that you can rest assured your food is stable and safe. With Well-Preserved: Recipes and Techniques for Putting Up Small Batches of Seasonal Foods, you will never again have a night when you open your cupboard or refrigerator and lament that there's "nothing to eat!" Instead, you'll be whipping up the seasons' best meals all year long. Eugenia Bone’s writing has appeared in the New York Times, The Denver Post, Saveur, Food & Wine, and The National Lampoon, among other publications. She is the author of Mycophilia, hailed by The New York Times as “A delicious, suprising and dizzyingly informative book,” Well-Preserved: Recipes and Techniques for Putting up Small Batches of Seasonal Food and The Kitchen Ecosystem: Integrating Recipes to Create Delicious Meals. She lives in New York City and Colorado. 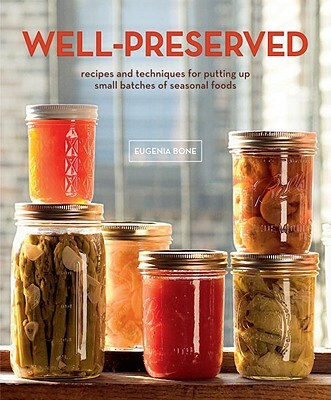 "[Bone's] alluring, easy-to-follow recipes for small quantities of jams, sauces, pickles and cured meats (more bacon!) are followed by recipes that incorporate them." "In these waste-not, want-not times, its no surprise that canning and preserving are staging a comeback. What is surprising, though, is how elegant and accessible these endeavors are in the hands of food writer Eugenia Bone."